Any mind map contains topics that are arranged in a radial structure. It depicts the relation (semantic, causal, association, etc.) between the concepts, parts, and components of the main idea. In addition to the main connections that make the structure of a mind map, topics can be linked to other lines. 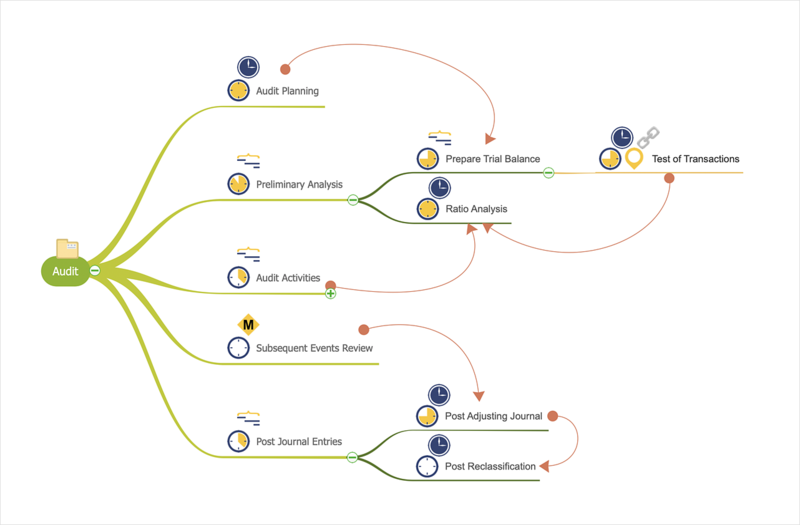 ConceptDraw MINDMAP allows you to show the relationships between topics, which belong to different parts of the mind map structure, but also influence each other. All related topics in a mind map can be connected if they are logically dependent. Relations help to show and organize complex interconnections between topics of mind map visually. Click the Relationship button on the Home tab (Windows), or on the Main Toolbar (macOS). There are special types of relationships for project management such as “Start to start”, “Start to finish”, “Finish to start”, and “Finish to finish”. Select the one you need. Click the relationship tool. When the relationship tool is active, a relationship mark appears near cursor. Drag a line between two topics. You can add a text to relationship if needed. Result: You can show how ideas are related to each other. You can edit and clarify relationship lines by dragging the control points and by adding a text to describe a particular relationship.